I have been so blessed to watch some amazing theatrical productions in London during the past few months, but sometimes it's nice to sit back and enjoy some raw local(ish) theatre, where there are no famous names, just ordinary people who have acting as a passion and hobby. 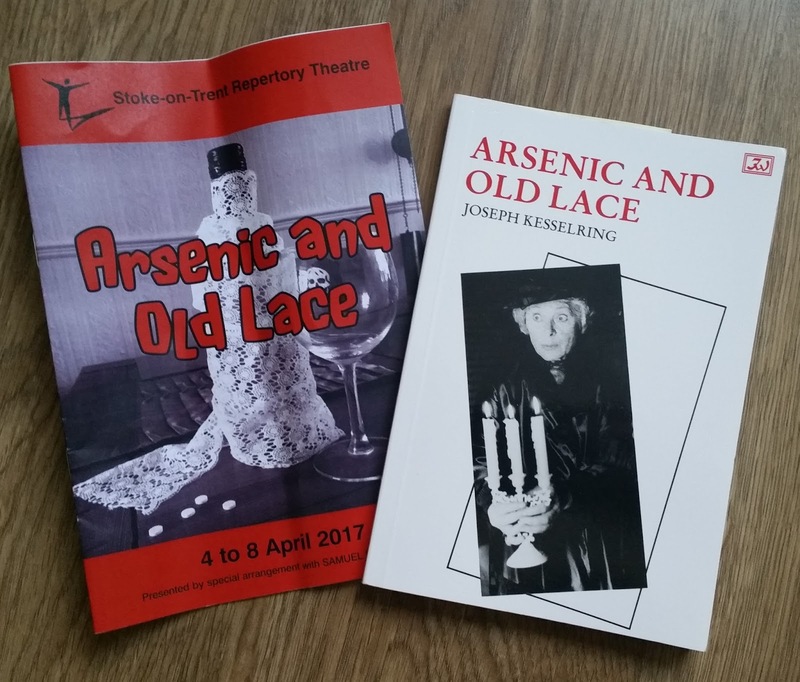 When I heard one of my colleagues was in a production of Joseph Kesselring's Arsenic and Old Lace, I thought I'd buy a copy and see what I thought. A couple of days later I was rolling about laughing at the ludicrous notion of two old ladies who were serial killers. It was so absurd, but not quite as absurd as a poor fellow thinking he was the president of the USA, Teddy Roosevelt! 1941, Brooklyn New York, Martha and Abby Brewster, two kind and sweet old ladies, hide a dark secret. They take on poor, orphan lodgers that they wish to save from the sorrows of the world, and then poison them with a glass of homemade elderberry wine. To ensure their souls are at piece, a service is held in line with whichever church that they belonged to, and then they are buried in the cellar. Their nephew Teddy lives with them. He is as mad as a box of frogs and believes he is President Teddy Roosevelt. This assists the aunts somewhat, as Teddy believes he is digging the Suez Canal in the cellar and the dead bodies are victims of yellow fever which must be contained. Teddy's brother, the theatre critic Mortimer Brewster often pops round to visit his aunts, and unwittingly finds out about his dear aunts hobby. He is mortified! If things couldn't be anymore absurd, his long lost brother returns to Brooklyn, he now looks like Boris Karloff due to extensive plastic surgery, required to cover his identity because he is a man on the run for murder! The cast took on this much loved American classic with great aplomb. Comedy, especially black comedies, are difficult to get right, and whilst the play took a little while to develop the pace required it was enjoyable to watch. It was hilarious to watch the matter-of-fact manner of the sisters who couldn't quite comprehend what Mortimer was so shocked about. A special mention must be given to James Freeman who played Mortimer Brewster; he stole the show with his accent, mannerisms and spot on delivery. He was perfect for the role of this poor bewildered chap, trying to make sense of the notion that his dear sweet aunts are serial killers! Nick Proud should also be justly pleased with his performance as Jonathan Brewster. He was reminiscent of Boris Karloff, as the play requires, although his delivery often reminded me of a send up of an Al Capone gangster, both threatening but also laughable. As the play spirals out of belief and the action becomes more frenetic, the play takes on more of its farcical nature that you imagine whilst reading it. Some of the cast struggled a bit maintaining a Brooklyn accent throughout the performance, which at times was distracting. This became more noticeable when it was imperative a quick pace was required. The slowness of pace to enunciate words in an american accent affected the tempo of delivery so some of the comedic timing was lost, but all in all it was an absolute treat to watch.